September 28 -- Naomi Skinner, a long-time receptionist at Cozean Memorial Chapel, was honored today by members of St. Paul Lutheran Church for the many years she spent as a volunteer worker at the church. Among her many duties at St. Paul was to head the Bereavement Meal committee. This, and other projects, accumulated a number of hours that total in the thousands. At the main Sunday church service at St. Paul today, she was presented with the "Naomi Skinner Award" plaque which will be hers to keep for a year. Each year in the future that plaque will be presented to another recipient of the Naomi Skinner Award for outstanding volunteer service to the church. Mrs. Skinner's daughter, Nancy Wilkinson, has followed her mother's footsteps as a greeter at the Cozean Memorial Chapel. 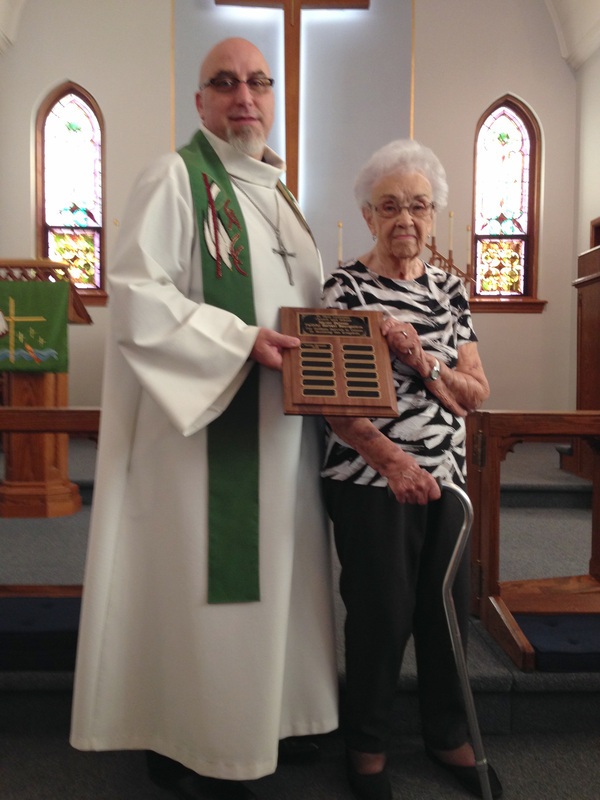 Naomi Skinner with the special plaque to honor volunteers at St. Paul Lutheran Church by pastor James King.